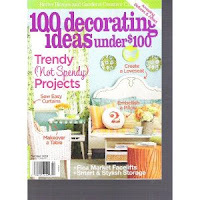 I love Better Homes and Garden special publication magazines! 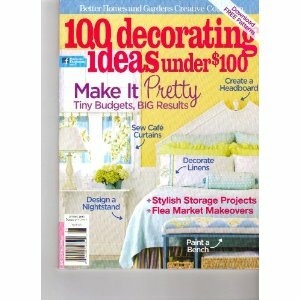 This series, 100 Decorating ideas under $100 is hands down one of my favorites out of all their publications. I pick it up every time I see a new one published (I believe it is once a season). I tag a lot of the pages in these books. One of my favorite projects I took on after reading the first one I picked up was painting a dresser for our nursery. At the time I had a 14 month old girl, but new she would soon start sharing her room with a new baby brother. I had an old dresser I was going to refurbish white so it would be general neutral, but after reading (and drooling) over a picture in this magazine, I went for it and ended up painting it a color similar to candy apple. It turned out perfect and I love how how it matches everyone's decor in the room. I can't wait for the next season to come out, in fact writing this posts makes me feel inspired to go look for it and start a new project!